Albert Tucker's photographs now reside in the collections of the National Library of Australia and Museum of Modern Art at Heide. Resurrected in the latter part of his life, Tucker's photographs have lead him to be called an 'accidental historian' particularly because of his documenting of fellow artists in Melbourne in the 1940s. Tucker bought his first camera in 1939 in order to document his paintings. However he went on to photograph people and places with great enthusiasm all the while acknowledging that his interests were primarily sentimental. Tucker never saw himself as a photographer but used the images as aids for his painting. 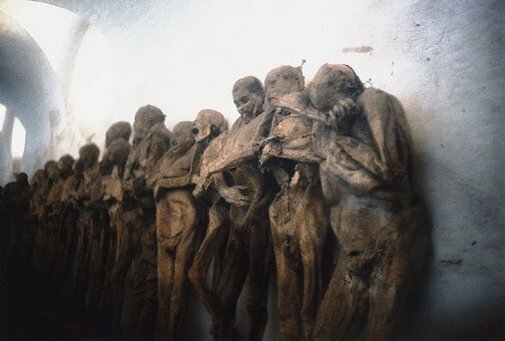 He was undoubtedly drawn to certain subjects, such as the 'Mummified Bodies...' (taken in 1969 when he was exhibiting in Mexico City) because distortion of the human form was of interest to him. Signed l.r., black fibre-tipped pen "Tucker". Not dated.